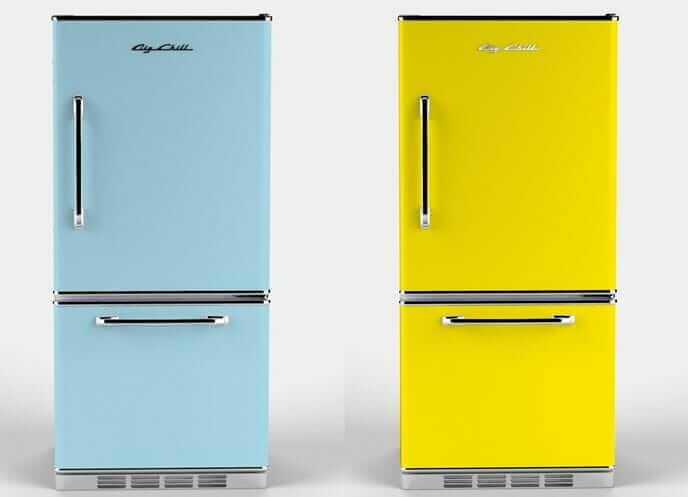 The original Big Chill has curvier, rounded like 1950s refrigerators. That's Orion Creamer on the right, his uncle and fellow cofounder Thom Vernon, on the left. The nice folks at Big Chill reached out and asked if I wanted to be the first on the www to show photos of their new refrigerator design, and I said, heck yes. 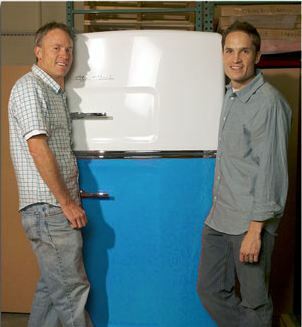 This is their new “Retropolitan” refrigerator, which is their first to feature a bottom freezer. I spoke by phone with Orion Creamer, who is co-founder of Big Chill and also product designer. He explained that (1) lots of customers have been asking for a bottom freezer and (2) lots of customers have been asking for a more mod style — “Jetsons, rather than Donna Reed”. So with the Retropolitan, Orion got rid of the curves that screamed 50s, but kept lots of chrome. He adds that, down the line, they may make some additional handles available. Since I had Orion on the phone, I also asked about the guts of the fridge. Yes: The ‘box’ for the Big Chills come from a major manufacturer, such as Amana. Then, Big Chill completely “re-skins” the refrigeratorswith a heavy gauge steel. Paint is powder-coated on. There are eight stock colors, oryou can order from over 200 custom colors. They use what’s called the powder coating RAL color chart as a reference. Doors can open to either the right, or left. This Retropolitan is slightly smaller in scale than the 1950s-styled Big Chill original. It’s 30″ deep (rather than 33″ for the original), 66″ high (vs. 68.5″). It is Energy Star-certified. Big Chill also offers a smaller Studio Series. This newest product seems to underscore a belief that there is a market for kitchen appliances in more colors than stainless steel, white, bisque and black: “We’re trying to expand out of being a company of 1955 designs to being a design company based on color and design,” Orion says. Color! Yay! Link (the new design should be up this week: Refrigerators and Stoves by Big Chill. Pam-We’ve been reading your blog for a while and I’m so happy you mentioned Big Chill. 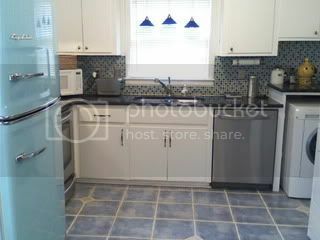 We recently purchased all the pieces, frig, dishwasher, stove and hood in beach blue. After saving and counting our pennies for over a year and picking Big Chill appliances instead of a wedding, we are very happy. Love the look of the new line! 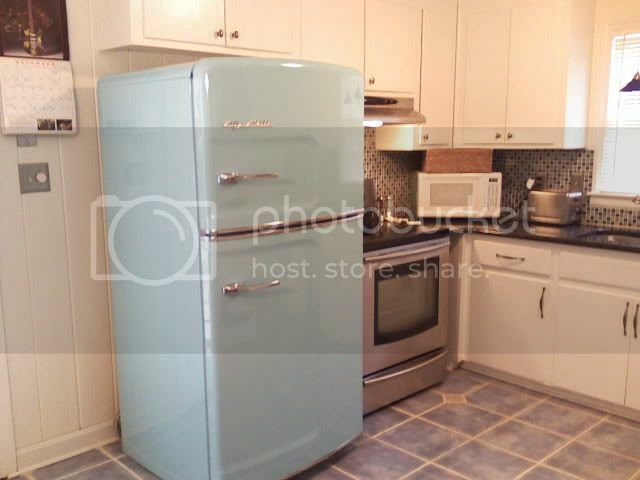 By the time we were looking at other fridges, we found out they were still pretty expensive. So, when we had our state energy star appliance rebate in 2010, we got the Big Chill in beach blue since it is energy star rated. We saved 15%–that was the state deal, so that was pretty good. It makes me smile every day. We thought about getting the panel for the DW, but we will probably keep the fridge as the focal point. Everyone who comes to the house loves it. People hug it! Our previous fridge was only 18 cu. ft, so the little bit of extra space in the Big Chill made a difference. The refrigerator design and concept is great, but the drawbacks are that they don’t come in stainless steel, which is very popular and versatile. Also, the handle-side options are very limited. 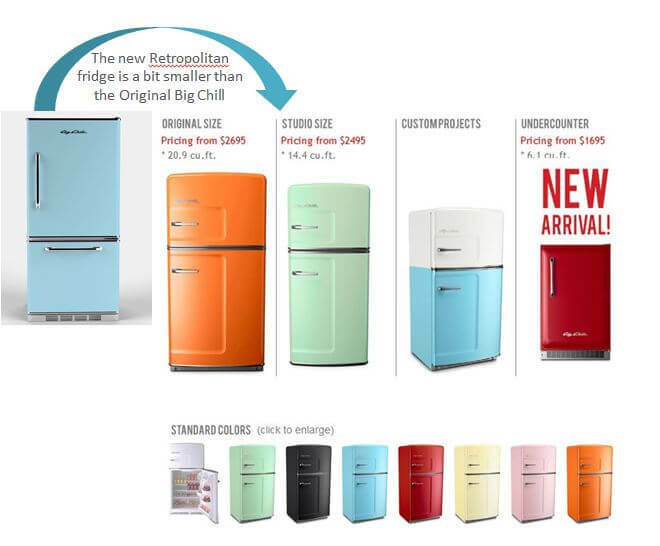 I think the whole point of the Big Chill design is to get AWAY from the ubiquitous stainless steel refrigerator. They are, after all, “vintage inspired retro appliances”. **sticker shock** Yikes..i do love the colors of the bottom freezers, but those prices!!! im gonna have to come up with something much more thrifty. for use as car molding ($30 on eBay). I also swapped out the plastic handles for vintage chrome stove handles I found on ebay for $33. I think my knock off looks great for the money. On the down side, mine has a textured surface and is still white. I think they make smooth door versions of similar fridges but I couldn’t find a cheap one. This fridge is in a house we rent out. I think I will make another one for another rental and paint it a fun color. Wow, nicely done. How did you bend the metal trim?